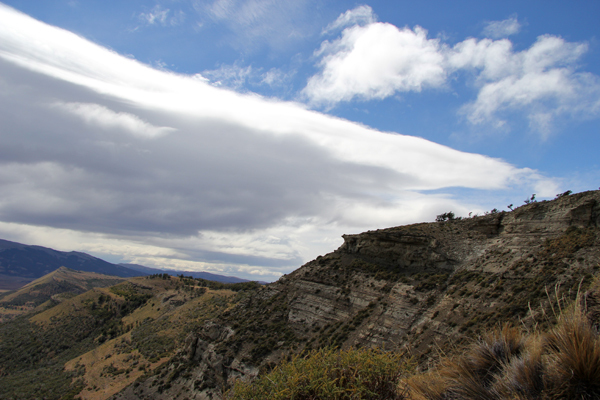 Quick update from Chilean Patagonia where I’m doing some geological field work for a total of five weeks. We arrived in Punta Areans last Sunday and then spent Monday afternoon at Instituto Antartico Chileno, where a colleague and I gave a talk and chatted with the scientists there. They do a lot of work on the Antarctic Peninsula, but also some paleobiological studies in the same region we are doing sedimentological research. It was great to meet and interact with the Chilean scientists. We then headed north up to the town of Puerto Natales along Seno Ultimo Esperanza, which is the jumping off point for a lot of tourists heading to Parque Nacional Torres del Paine. We’ve been coming here for several years and have made some friends over that time, so we spent a bit of time visiting with a woman whose hostel we used to stay in back when we were grad students. We’ve spent the past few days easing into the field season with some detailed work on some turbidite channel outcrops discussed in this paper. The photo above and a bunch in this Flickr set show what the landscape is like here. We are staying in a little farmhouse-style hosteria that has internet, but it’s intermittent and very weak. I’m really only able to provide some updates via Twitter (see sidebar at right); I tried to upload a 200 kb photo and it failed numerous times. Oh well, that’s how it is. Right now we are in town doing some errands so we stopped in a cafe that has stronger wi-fi. I’ll try to provide updates like this whenever I have a chance. Those Bouma sequences are lovely! Great photos.